Team nears end of its summer schedule, following last weekend's Jay Rowan Open, hosted by Redmond Aquatic Club Eels. 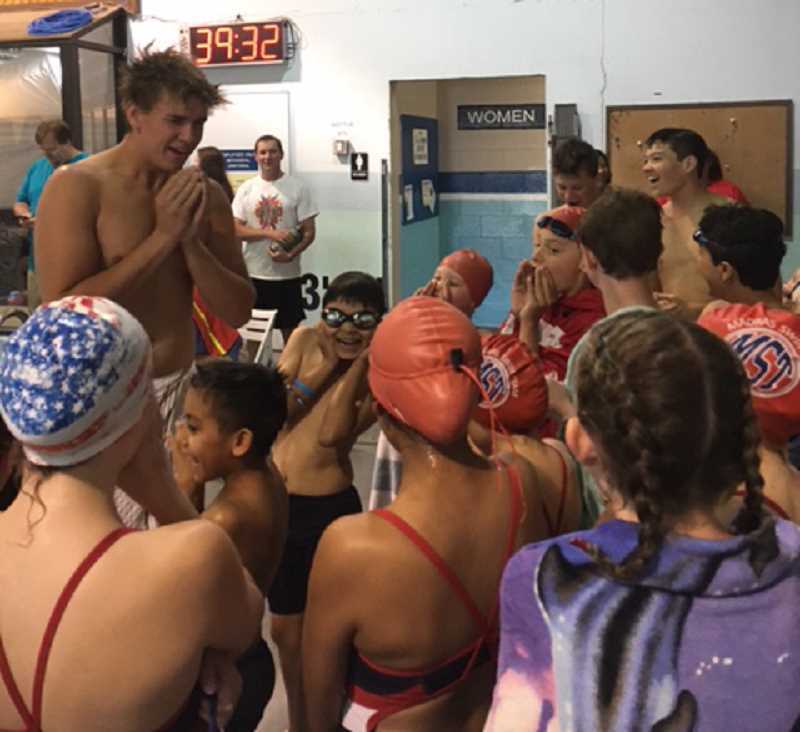 Madras Swim Team's 12-year old Julian Hollingshead had a high success rate last weekend at the 2017 Jay Rowan Open, hosted by Redmond Aquatic Club Eels. Of his seven individual races, Julian was victorious in five and runner-up in two. In his signature 50 and 100 breaststrokes and freestyles, his winning times were also personal bests. His other victory came in 200 freestyle where he just missed a state qualifying time. Garrett Webb and Ethan Graeme also picked up one victory each — Webb in the 100 breaststroke, and Graeme in the 100 backstroke. Head coach Tim Nelson noted that the meet was also an excellent venue for novice swimmers and those new to competition. Two first- time competitors were Cypress Toman, 8, and Uriel Mejia, 12. "Cypress was a bundle of nerves before her first race and all smiles 30 seconds later. Uriel looked like he had a thousand races under his belt and tore it up all weekend," said Nelson. Nelson added that Sawyer Rhodes, 8, and Jarren DeWhitt, 12, posted big time drops from just two weeks ago. Rhodes had second- place finishes in the 25 freestyle and 25 backstroke. All told, MST swimmers collected dozens of ribbons (given to the top six finishers) and combined for scores of personal bests. Other swimmers who collected ribbons and their highest placings were: Johan Garcia, 8, placing fourth in the 25 backstroke; Shelby Anderson, 9, placing fourth in the 100 backstroke; Sophie Nelson, 10, placing third in 100 butterfly; Colby Anderson-O'Brien, placing second in the 100 butterfly; Aurora Gerhardt, 20, placing second in the 200 individual medley; and assistant coach Sara Nelson, placing second in the 400 freestyle, where she lowered the Oregon masters record for the 45- to 49-year-old age group from 5:02.37 to 4:57.06. Ninette Garcia, 11, combined with Anderson-O'Brien, Hollingshead and Sophie Nelson to capture second place in the mixed 12-and-under 200 freestyle relay. Mylaena Norton, Brennan Frank and Emma Shierk also competed for MST. Also last weekend, sisters Elli and Lexi Williams traveled to Palo Alto, California, where they attended a five- day swim technique camp at Stanford University. The camp was directed by Greg Meehan, the 2017 NCAA Women's Coach of the Year and a member of the 2017 Team USA World Championships coaching staff. He was also the coach of 2016 Olympic gold medalists Simone Manuel, Maya DiRado and Katie Ledecky. The girls were lucky enough to get a hug from Ledecky in a chance meeting. Hollingshead also attended an elite camp last month at Stanford emphasizing intense training. Next up for MST is the OSI 11 & Over State Championships in Gresham July 28-30. Lexi Williams, Hollingshead, Graeme, Webb, and Sara Nelson have qualified for the meet. After that, MST will travel to a season-ending meet in Coos Bay — Tim Nelson's hometown, where he competed from 1975-1986.